© 1986 by Kathleen Kemsley, published in We Alaskans magazine, June 1986. They say there are only two times when the salmon fishing is good: when it’s raining and when it isn’t. The other requirement is that it be light enough to see where rocks lie hidden just beneath the surface of the river. During the endless light hours of summer, each day slides into the next with no further notice than a slight dimming of illumination, a pause to take a breath before the next day rushes in. I joined the throngs of salmon-crazed anglers several evenings ago and went up to the Kenai River to try for a monster king. It rained and it didn’t rain; I ate chicken salad and chocolate chip cookies with my fishing partners and sang songs to pass the time. We motored up through the current and drifted back over a hole countless times, jerking our poles expectantly at every little tug of flowing water on the lines. We had the river almost to ourselves that evening. We shared the fishing hole with terns and herring gulls that were busy dive-bombing the water for hooligan and insects. Clouds parted briefly to reveal a sky of blazing azure. Without fanfare a rainbow sliced through the air and disappeared into the silty green water upriver. Daylight hung like backlit curtains around the boat. Over the sound of water slurping past the sides of the boat, the plink of raindrops on my hip boots was almost unnoticeable. A bite on the hook brought us all to attention. My shout of “fish on!” was redundant, as my pole wavered wildly above the current. Ten minutes later I landed a 48-pound king salmon. I could not take my eyes off of her as she slid around on the bottom of the boat. I had never seen a fish so big. Shortly before midnight we reluctantly pulled the boat out of the water and snapped some pictures before I started for home. Six times along the 50 mile drive, I slammed on the brakes of my truck to allow the crossing of a moose with one or more calves in tow. The newborn calves’ wobbly stick legs refused to observe the rules of right-of-way, so I waited patiently for them all to move safely off the highway. 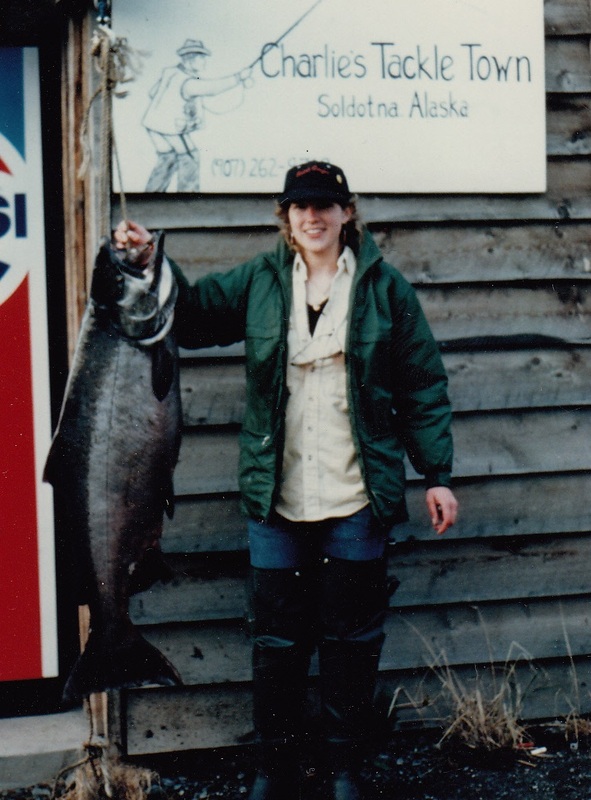 That was how, at one o’clock in the morning, I came to be kneeling on the cabin porch filleting a salmon in the twilight of an Alaska summer night. My thoughts wandered forward to the coming weeks, when sandwiched between work shifts I would be entertaining visitors from Outside, attending meetings in town, going on emergency ambulance runs with the local fire department, taking the dog for walks in the woods, and riding my mountain bike down dirt roads in search of rainbow trout streams. There was salmon to smoke and berries to pick, oil to change and wood to haul. Somehow, too, the dishes would have to be washed and the floor of the cabin swept. What happened to the time I spent sleeping late last winter? It seemed to have disappeared with the last ice on the lake. Lately the days have melted together in a blur of daylight. In a moment of clarity, I looked beyond my arms, immersed to the elbows in fish eggs, to the season looming ahead. I had to accept, and in fact embrace, the exhausting days to come. There would be plenty of time for rest later, I knew, once the season turned again and long winter arrived. But for now, I would burn with the midnight sun.